Oak Bay Parks, Recreation, and Culture is excited to announce another season of free concerts in Willows Beach Park (Beach Drive at Dalhousie Street) this summer! 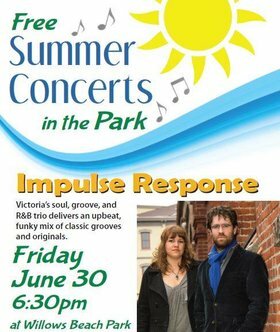 Join us for the kick-off concert on Friday, June 30, featuring local band Impulse Response, with singer-songwriter Ronda Rozon opening. Bring a blanket and picnic, and enjoy the free music in a beautiful setting! Impulse Response is Victoria’s funkiest soul, groove, and R&B trio. The group is small with a big sound. Shanna Dance and Alexander Ferguson front the band as lead vocalists. With tight and punchy grooves, their sound is infused with sweet and soulful harmonies. The bands influences include: Soulive, Aretha Franklin, Bill Withers, The Meters, Herbie Hancock, Justin Timberlake, Donny Hathaway, Joss Stone, John Mayer Trio, D’Angelo, Michael Jackson, Lauryn Hill, Stevie Wonder, Alicia Keys, Marvin Gaye, and Ray Charles. This group is comprised of talented musicians who have played at such popular island venues as: Hermanns Jazz Club, Swans, Bard and Banker, Canoe Club, Vista 18, Darcy’s, Bartholomews, My Bar and Grill, The Oswego Hotel, The Bengal Lounge, Victoria Jazz Society’s TD Jazz Fest and Blues Bash Festivals, and many more. Their all original EP "Light Waves" is now available. The feedback from the community was so positive last summer, that this year we are offering 6 concerts throughout the season. All concerts start at 6:30pm. 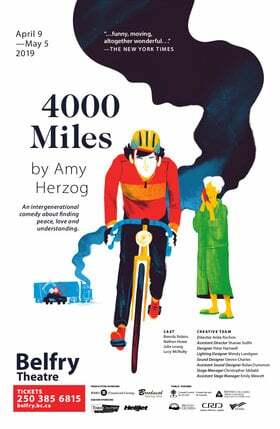 Thanks also to Oak Bay News, our media sponsors for the series.